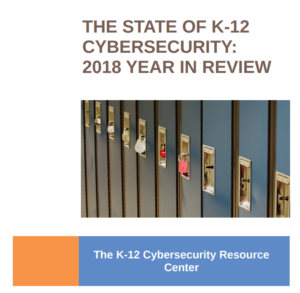 Every two weeks, Keeping K-12 Cybersecure–the newsletter of the K-12 Cybersecurity Resource Center–curates the best cybersecurity and privacy news for K-12 policymakers, administrators, IT professionals, and privacy advocates. The latest edition (“Censure or Celebrate Student Hackers?“) provides information on recent updates to the K-12 Cyber Incident Map, other additions to the Resource Center, and curated news you can use. A private high school in Illinois was recently the victim of a targeted DDoS. The culprit: a 14-year old student who now is facing potential criminal charges. Seems a familiar story, yes? How are schools supposed to manage public social profiles created for them (with or without their consent or knowledge) on major technology platforms? It’s a recipe for mischief as recent stories illustrate (“These Virginia school names got a strange makeover in Google searches“, “Little Miami High School profile hacked on Google“). When schools select software with no regard for student privacy or security, students *should* speak up and demand better (“Exam Software Sparks Law Center Student Backlash“). This isn’t a new issue, but a notable challenge to the practice. I’m pretty sure this article from Australia (“How hackers are getting inside our kids’ classrooms“) includes all of the most common hacker tropes, coupled with some interesting technical claims. Having said that, if schools are running open, unsecured WiFi networks, they are asking for capital-T Trouble. Fortnite is popular. Really popular. So popular its now attracting some unwanted attention (“A Sexual Predator Is Allegedly Extorting Kids for Explicit Photos in ‘Fortnite’“). Be sure kids are equipped to seek help if things go wrong. The Electronic Frontier Foundation (EFF) takes aim at Google’s conflicts of interest in determining the default features available in its Chrome browser: “Google Chrome, the largest browser in the world, has no built-in tracker blocker, nor has the company indicated any plans to build one.” (“Google Chrome’s Users Take a Back Seat to Its Bottom Line“). Blockchain is (not) the future of education (“Chinese headmaster fired after stealing school’s electricity to mine cryptocurrencies“). And, speaking of China: “China’s brightest children are being recruited to develop AI ‘killer bots,’” which is really quite the lede.